Posted in Unfolded Hearts and tagged blessings gifts peace joy, Christ Jesus, Christianity, Christmas, faith, Family, Religion & Spirituality, WordPress, WordPress.com, Writing. Bookmark the permalink. The Christmas season is fast underway! I hope you are able to take some time and recognize the rhythm of His grace and enjoy all He has given to you, to each one of us. As I was preparing things in my home for the season, the Lord showed me the word “joy” three times. I felt He wanted to me to know more on this word and to share it here with you. To be perfectly honestly, I was a bit hesitant to pursue and speak on joy – I mean, I watch the news and hear the daily devastation and great personal loss that our communities are contending with locally and across the globe. We are in a unique time in history, in which joy is not commonly found. Yet, when I open the Word of God, specifically to the book of Luke, there is different news for me, for us. A declaration of joy! In fact, a declaration of great joy that has come. So, let us too come and see what the Lord has done together and hear what he might say regarding Joy. Then the angel said to them, “Do not be afraid, for behold, I bring you good tidings of great joy with will be to all people. For there is born to you this day in the city of David a Savior, who is Christ the Lord. The Hebrew definition for joy: glee, exceeding gladness, mirth, pleasure, rejoice. The Greek definition states: calm delight, gladness. Joy is given by God. It is established in our hearts along with the confidence of hope. It is the fruit of the Holy Sprit, an evidence He is with us. It’s not just a simple smile or laugh based on our surroundings or on a successful outcome of our own performance. Joy is something that is deep within and doesn’t leave quickly. God wants us to have joy. We can learn more in His Word [see below] that its Christlikeness within. But the fruit of the Spirit [the result of His presence within us] is love [unselfish concern for others], joy, [inner] peace, patience [not the ability to wait, but how we act while waiting], kindness, goodness, faithfulness, gentleness, self-control. Against such things there is no law. For the kingdom of God is not a matter of eating and drinking [what one likes], but of righteousness and peace and joy in the Holy Spirit. Let me ask you, who do you know that exhibits these kingdom traits? Maybe for you, you’d list three different people, one for each trait: righteousness, peace, and joy. As I ponder this question myself, I desire to see an increase in genuine joy, gladness, and a calm delight. These will only be fulfilled as we yearn to seek the one who possesses and eagerly dispenses these heavenly traits in earthly vessels. Yearn, friends, for Jesus to fill you and your household, that the whole counsel of God might be fulfilled in the fruit of the Holy Spirit. There’s a classic acronym for joy you may have heard. Jesus, Others, Yourself. While this is a well noted phrase to follow. I’d like to introduce a new acronym for a new discovery of the fruit of joy in this unique season. J, for Jesus, He remains first-rightfully so! O, is for Our, He is ours personally & intimately. We belong to Him. Y, is for Yearning; yearning is to desire strongly or persistently. How we need Him! How we need to get back to Yearning for Our Jesus as only He can turn things around for the kingdom’s cause in this unique season expectant for good news and JOY. May this song by Lauren Daigle minister to you. 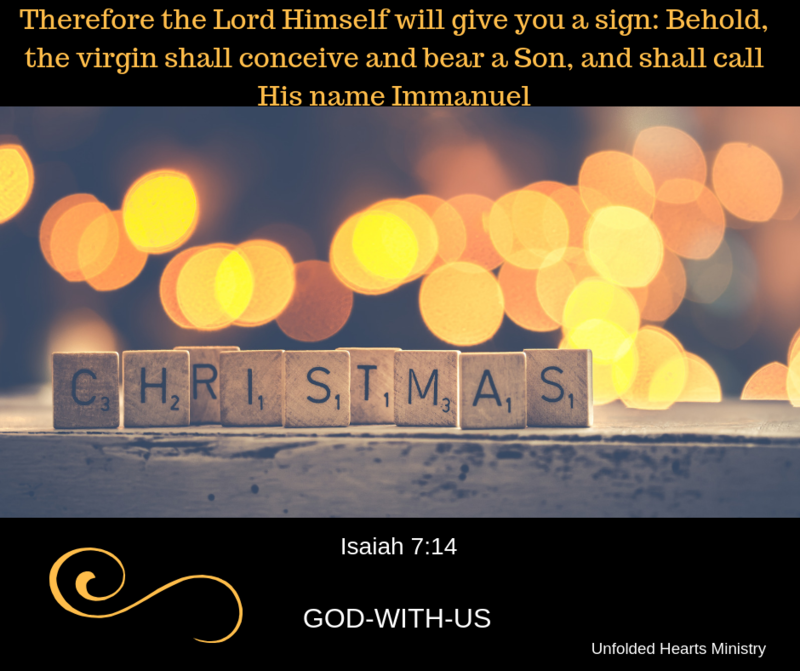 Posted in Unfolded Hearts and tagged angles, Christianity, Christmas, faith, fruit of spirit, good news, greek, hearts, hebrew, holiday, Holy Spirit, hope, Jesus Christ, joy, Lord, Religion & Spirituality. Bookmark the permalink. Powerful God … Prince of Peace. If our greatest need had been information, God would have sent an educator. If our greatest need had been technology, God would have sent us a scientist. If our greatest need had been money, God would have sent us an economist. But since our greatest need was forgiveness, God sent us a Savior. Christmas cards. Punctuated promises. Phrases filled with the reason we do it all anyway. He became like us, so we could become like him. Angels still sing and the star still beckons. He loves each one of us like there was only one of us to love. Posted in Unfolded Hearts and tagged Christ, Christianity, Christmas, forgive, forgiven, God, Holy Spirit, Jesus, Jesus Christ, love, Max Lucaco, Max Lucado, Religion & Spirituality, Savior, Templates, Tools, Twitter, WordPress, WordPress.com, Writing. Bookmark the permalink.